We believe you need the access to get the experience. Journalistic work made easier - ifnm! There is no additional charge for a letter of accreditation besides the annual registration fee for your ifnm membership. Many bloggers, online writers, freelance photographers and news journalists simply don't know how to get a press pass or press credentials to events such as trade fairs, media events, conventions or concerts. Most of the time you can arrive at the press gate some minutes prior to an event, show your credentials and pass through. 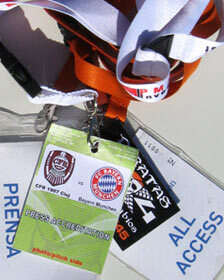 For smaller or non-ticketed events this may work at times, but for larger events such as trade fairs, concerts, media events, festivals, sports venues and anywhere else with limited access to the public, journalists must apply for a press pass issued by the promoter ahead of time. Understandably, businesses and event organizers want to work with serious journalists who are pursuing legitimate research interests. For high profile events, the editor of ifnm press agency will write letters of assignment or submit applications on your behalf to help you gain access. ifnm is always helping to get your accreditation. Media representatives with the proper press pass may receive exclusive invitations to events as well as discounts on hotels and rental cars. Please find an accreditation form (pdf) on ifnm company letterhead for future accreditations on the link below. Please send the completed form 6-8 weeks prior to the event that you want to cover to the following email address. The completed form should be typewritten. We only accept accreditation PDFs that are type-written. The earlier you submit this form, the greater your chances becoming accreditation (your Press Pass to the event). By return email you will then receive an accreditation letter by email signed by the ifnm Publisher/Assignment Editor, Editor-in-chief or Bureau Chief. To obtain a press pass, you will need to contact the organizers of the event approximately 6-8 weeks in advance and follow their required protocol. Journalists requesting media credentials must pre-register for the event and collect their badges before entering the Press Office / Registration desk. You can usually find the contact online. Please visit the event organizers website and locate the contact information for the organizers press relations department. Accreditation will be valid for the duration of the event. Please Note: Submission of a request does not guarantee press accreditation. ifnm does not guarantee you will gain entry to any event. Some events limit the number of journalists and photographers. 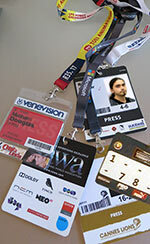 The final decision about press accreditation lies with the event organizers. Many organizers routinely ask for background about the news organization and require official accreditation. Should you have any questions, or require further information please do not hesitate to contact us. 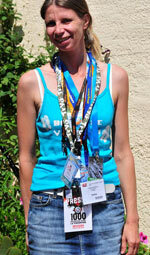 ifnm - Your international journalist Press Credentials / Press Pass to media events and trade shows!